The SMOANT NABOO kit is a mod and a mesh coil sub ohm tank, and in true SMOANT fashion, it is styled impeccably. The kit showed up on my doorstep a couple of weeks ago, and since then I’ve been using it alongside a bunch of other mods and tanks that I’m in the process of testing. Seriously, I’m drowning in vape gear; if any of you are interested in doing reviews for VapeBeat, drop me a line on Facebook! 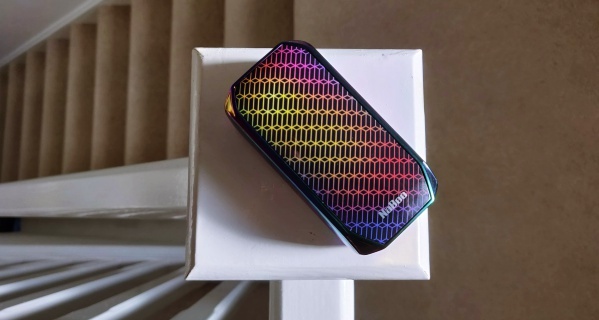 OK, back to the review: the mod itself is fairly portable, very well priced, and has a really nice look and feel to it – providing you like that rainbow finish that is so popular right now. Is it legit? 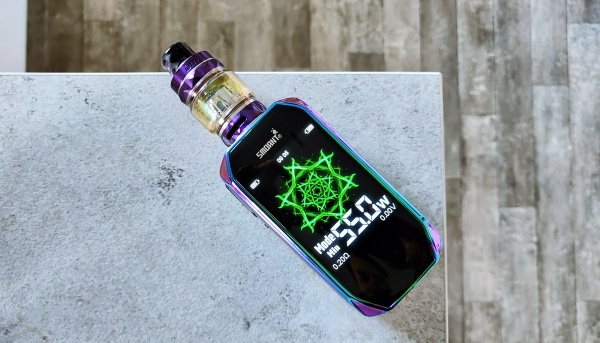 Is it better than GeekVape NOVA or the Vaporesso POLAR kit? 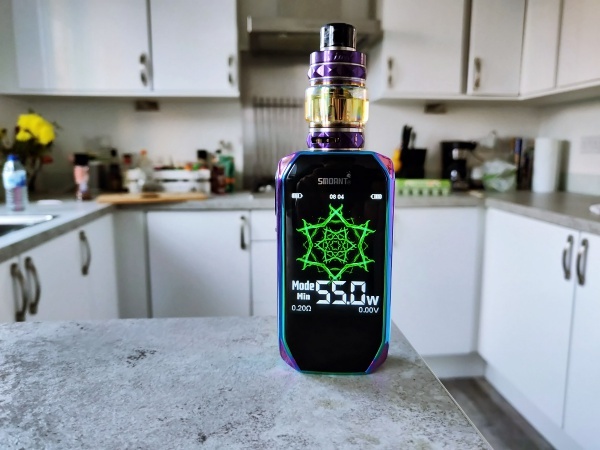 Can it beat the vape mods listed inside our Best Vape Mod 2018 Guide? 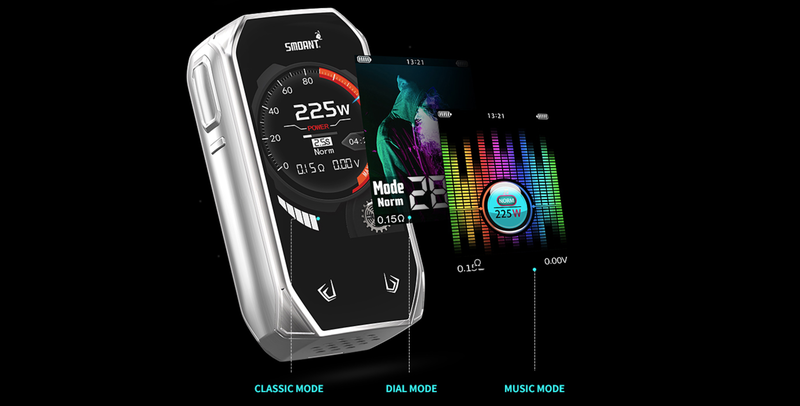 The mod is designed to be nice and portable; it sits pretty nicely in the hand and the front of it is dominated by a massive 2.4in TFT panel. It looks freakin’ brilliant and kind of reminds me of the POLAR mod. Dimensions are as follows: 91 x 48 x 31mm, and it feels nice and light in the hand, even with two batteries inside it. The main event is obviously the display, however, which more or less takes over the entire front of the mod. It’s not a touchscreen mod though; rather, it utilizes a pair of capacitive buttons that are hidden from view and only pop into existence once you tap the smaller button below the fire key. Once this key is tapped, it reveals the power rocker, where you can augment the power or temperature. It also doubles as navigation for the mod’s menus and settings. It’s a really cool feature too, because when the buttons aren’t active, the power and controls are effectively locked, so they can’t change while in your pocket. The entire back panel slips off easily enough, and inside you’ll find a snug compartment for two 18650 cells. The panel is held in place by magnets and, once installed sits completely flush to the mod, and makes it impossible to see any breaks in the design. So far, so good. As you can see in the image, my review unit is the rainbow number. Looking at the other color options, I think, given a choice, I would normally go for either the red or the black model. Still, the rainbow one does look pretty cool. As you can see from the full specifications list below, the SMOANT NABOO features pretty much everything you’d expect from a mode vape mod. You have TC, curve modes, wattage, and pretty much everything else in between. The NABOO mod runs SMOANT’s updated ANT225 chipset, and this brings with it a bunch of cool features. Beyond this, you’re getting one of the fastest firing mods in the game; the NABOO will fire within 0.0015 seconds. That’s quick, even by today’s standards. I predominantly used the mod in wattage mode, and here it excelled. It’s easily a match for the VooPoo DRAG with respect to power delivery, and I think it actually looks better too. 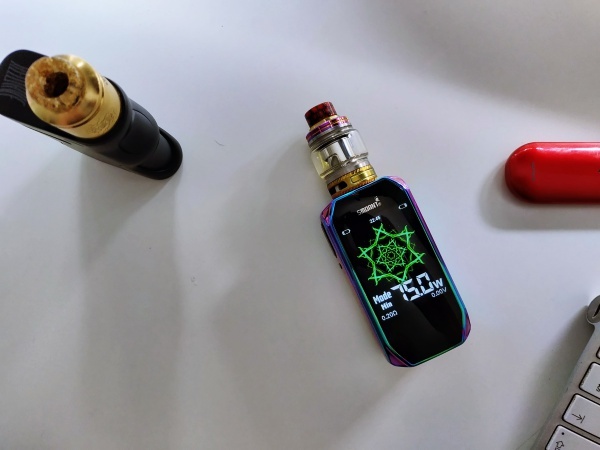 TC mode is decent as well, not the best but it is certainly accurate enough to satisfy most temperature control vapers, providing you’re not coming from a DNA or YiHi mod. Throughout the past two weeks that I’ve been using this mod, I’ve constantly been looking for holes in its performance, things it doesn’t do well. But I couldn’t find any – it just works really, really well. 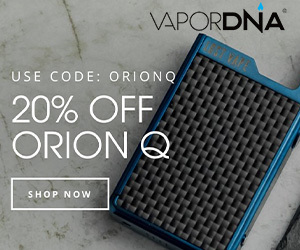 For a mid-range mod, it is definitely up in the top 1% of vape mods on the market right now. It performs brilliantly with all styles of tanks and is perfectly happy rocking along at 150W or 20W. No complaints from me, basically. Decent. 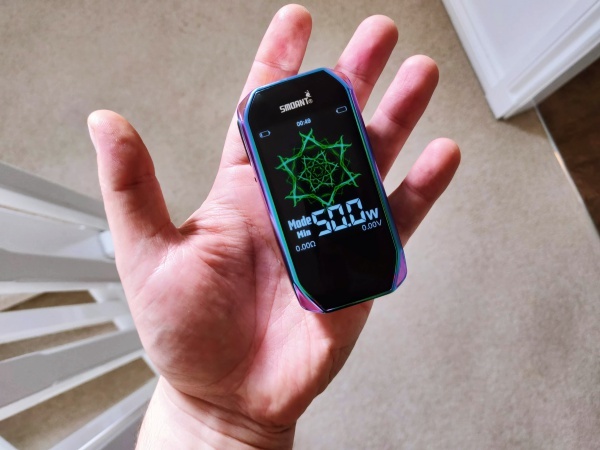 You got two 18650 cells to play with, and this should deliver a solid day’s worth of vaping, providing you’re not using rubbish batteries or vaping solidly at 150W. I tended to run the NABOO in and around 55-65W and this got me pretty consistent, all-day battery life. Whack a Kayfun on it and run it at 18W and you’re looking at 2-3 days of vaping. I was worried the large display would soak up a lot of precious battery power, but this doesn’t seem to be the case. The NABOO is as good as the GeekVape NOVA with respect to battery life, and that mod has a tiny display. You know that massive, 2.4in TFT display? Well, you can change the screensaver to anything you like, just like you could on phones in the 90s. To do this, you need to update the firmware (do that by using this link). I didn’t bother to be honest, as it’s not something I tend to do even on my phones. But if you like this sort of thing, SMOANT’s got you covered. The NABOO also rocks a few UX designs too: you have Classic Mode, Dial Mode, and a new option called Music Mode. They’re all relatively attractive and display all the pertinent information. I kept mine on the classic mode, as I like the way the fonts and numbers look. But the music mode does look very good too. Ah mesh coil tanks, they’re everywhere these days. With this in mind, it’s no surprise that SMOANT decided to include on inside the NABOO kit. 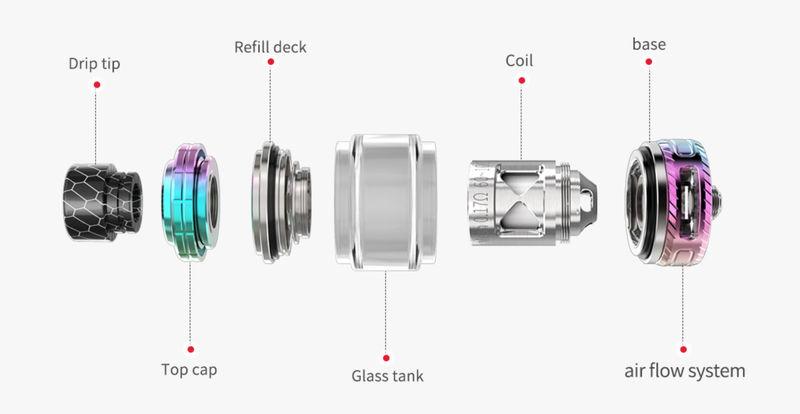 And while the SMOANT Nebulizer isn’t going to give the FreeMax Mesh Pro any trouble, it is certainly a very solid mesh kit-tank. The flavor is decent enough, a 7/10 or thereabouts, and the mech coils wick quickly. Very quickly, actually. You prime it and then, 60 seconds later, you’re vaping. Coil head performance is also very good; you’re looking at around 10-14 days per coil, which is very good. The tank is a handsome chap too, perfectly suited for sitting atop the NABOO mod. I do like it, for a kit tank, and it does work really well. I just wouldn’t go and rave about it as a standalone setup, if you get me? 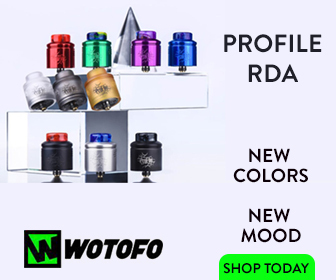 There are some truly great mesh coil tanks around right now, and while the SMOANT Nebulizer is decent, it’s not in the top 10 options right now. But then that niche of tanks is hugely competitive anyway. For a kit tank, though, it is very good. It’s way better than the POLAR’s, for instance. Ditto Innokin’s Cascade kit. Bottomline? This mod and tank combo is VERY impressive. Easily of the best vape kits I’ve had the pleasure of testing in 2018. And for the price – around $79.95 – it serves up some pretty decent value for money too.